Weekly boring update, take five! Nothing really exciting going on this week. Tim is having to work every weekend in February, but he took off one day of vacation during the week to go play golf when it was warm. He’s starting to get antsy for the time to change and him to switch to golf mode. Which means I will turn into a golf widow for 7-8 months. Sigh. Sad that… Supreme Court justice Antonin Scalia passed away over the weekend. The court had a balance between conservatives and liberals and I’m afraid that the scales are going to tip away from the conservative side. Very sad day indeed. Things we ate: Sunday night, we had wings while watching the Super Bowl. Monday, we had tomato soup and grilled cheese, something I’ve been craving for a while. Tuesday I made a crockpot ravioli and a big salad. Wednesday night, from a choice of 3 items, Tim picked eggs in purgatory again (we had bacon and cheese grits with them again, any one want to guess why he picked this one?!). Thursday night, I got Tim to grill out, we had grilled salmon, grilled asparagus and wild rice. Friday night we had chili dogs and chips. Saturday we ran late to Lowe’s, so rather than coming in late and fixing food, we swung thru Chick-Fil-A and got sandwiches. Yummy! TV and Movies: I don’t think we watched any movies this week! We were mostly watching regular TV shows from the DVR. I truly think the only thing we watch live all year long is the Super Bowl, and that was a struggle. Tim was constantly grabbing the remote to fast forward thru the commercials, and I was like, “I wanna watch the commercials!! !” It doesn’t take long to form SOME new habits, now does it?! 🙂 DVR’s have definitely changed the way we watch tv. We never watch a show live and rarely watch it on even the same night it is on. We gave up on Duck Dynasty and deleted it from the DVR. We tried a couple of episodes of Brain Games and liked it. We’re nerdy that way 🙂 Kept up with our regular stuff on the DVR (NCIS x3, Limitless, Scorpion, Blacklist, Elementary, Blue Bloods, etc). Looking forward to Survivor starting back next week. 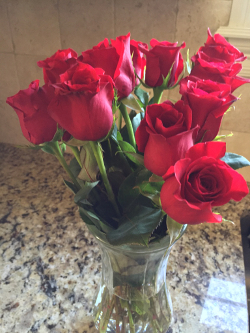 Something that makes me happy: – I came in Thursday to discover an early Valentines happy from my sweetheart!!! I do not sing in the shower. And I don’t play music there either. I like to think while I shower. I have some of my best ideas there (especially for my blog…which I promptly lose the moment I am dried off enough to write down even a scribbled note). We barely ever watch anything live anymore either. Just sports and the occasional show, when we have nothing sitting on the DVR to watch. Sometimes, we’ll watch a sit com on the night it airs (but usually we let it record and watch it off the DVR when it’s done LOL). Mostly everything is a day or so after the fact though. A lot of our shows air at 9 or 10, and Troy gets up at 4, so he’s often in bed by 9:30. 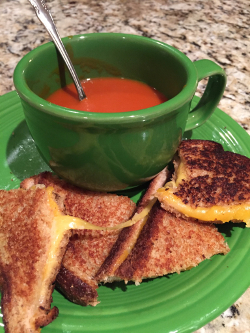 Mmmmm…grilled cheese and tomato soup. Total comfort food! I’m not a shower singer, but I get the speaker. I don’t have one, but I’d love one. I can spend forever in there and music helps me to relax. But if you see me break a bone in the the future know I probably got one of these and attempted to dance in the shower!! !